The white-tailed deer is a type of deer that is found throughout most of North America, and only some in South America. 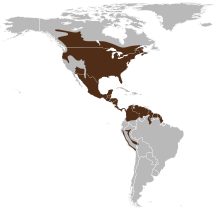 The white-tailed deer were also brought over to Europe and New Zealand. The white-tailed deer is normally between around 57 and 137 kilograms (125 to 301 pounds) in weight. Its body is between 160 and 220 centimeters (63 to 86 inches) long. It is mostly colored brown, but can also be greyish or reddish in winter and summer. Male white-tailed deer have large antlers. These fall off in the winter. The white-tailed deer mostly lives between two and three years long. Sometimes, though, they will live for more than ten years. This type of deer is quite shy. When they are scared, they run very fast, and wave their tails. They mostly stay alone and in the same location throughout the year. During the autumn, the deer engage in mating. They mostly eat vegetation like tree leaves or smaller plants. The deer feed mostly during the morning and evening. Predators of the white-tailed deer include animals like wolves, coyotes, bears, and mountain lions, as well as humans. ↑ "Odocoileus virginianus". Bucknell University. Retrieved 28 October 2010. ↑ 2.0 2.1 2.2 2.3 "Odocoileus virginianus". University of Michigan Museum of Zoology. Retrieved 28 October 2010. This page was last changed on 1 July 2016, at 07:32.